Sweet, salty, savory Vietnamese fish-sauce wings. Last Friday. 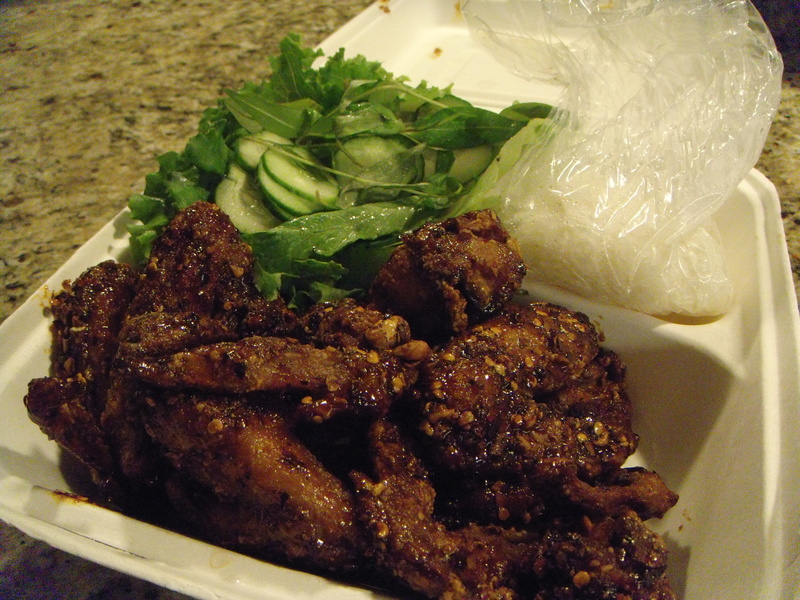 It seems like a lifetime ago, now, but lingering throughout the oceanic week were memories of our casual takeout dinner from our new(ish) neighbor, Pok Pok Noi. Bearing little resemblance to the Thai menus I’m used to, Noi serves up traditional Thai street food easily eaten standing up, or perhaps sitting on a curb or stoop, food perched on knees. And, in keeping with the street-food theme, it’s not uncommon in the summertime to see couples sitting under umbrellas at the two sidewalk tables devouring ears of grilled corn, skewered meats and the like. Located next door to Grain & Gristle, the tiny restaurant does a brisk takeout business, but you’ll always find people eating at the few seats at the bar, standing up by the front window overlooking the aforementioned picnic tables, or sitting on the petite patio out back. Walking through the front door, you’re greeted with the unmistakable aroma of fish sauce and chiles. The backlit signage next to the bar depicts the menu’s offerings, and a blackboard details a drinking vinegars and other libations, including bottled and draft beers, cocktails and coffees. For our living-room picnic, we ordered the Het Paa Naam Tok, a salad made with forest mushrooms, shallots and lemongrass that arrived with a little container stuffed with a magical mixture of cilantro leaves, mint and a prickly toasted rice powder, When mixed with the meaty mushrooms, the result was an earthy, spicy, bright salad. And then the Papaya Pok Pok salad: julienned green papaya, tomatoes, and long beans with spicy, aromatic lime and fish sauce complementing the fresh veg. Optional soft-shell black crab makes the dish a bit of a project: biting, sucking, slurping and discarding, but delicious nonetheless. Alongside the dish, a plastic sandwich baggie with a scoop of sticky rice, easily pinched off and eaten with the fingers. Beyond salads, we ordered the Muu Seteh, pork loin skewers topped with a tiny gem of glistening pork fat, served with an addictive peanut dipping sauce. But the star of this show is the much-written-about Vietnamese fish-sauce wings: a heap of dark, sticky, sweet, salty, meaty chicken wings, so addictive, savory and satisfyingly filling. The first time we ordered them, I could not fathom making a meal of chicken wings, and yet, that’s what happens. We say it all the time, and you’ll probably tire of hearing it before we stop: We feel so lucky to live in this amazing neighborhood, and jewels like Pok Pok Noi make our good fortune that much better. 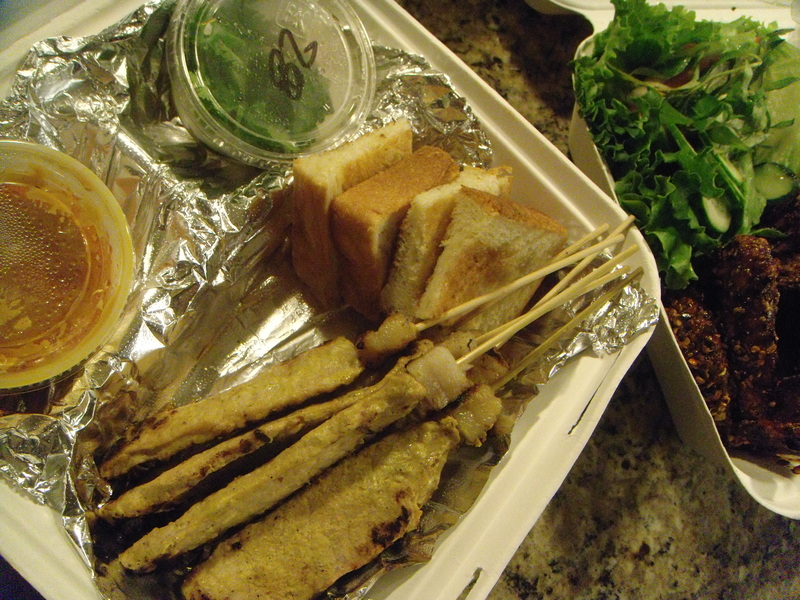 Pork loin skewers, peanut dipping sauce and toasted white bread. 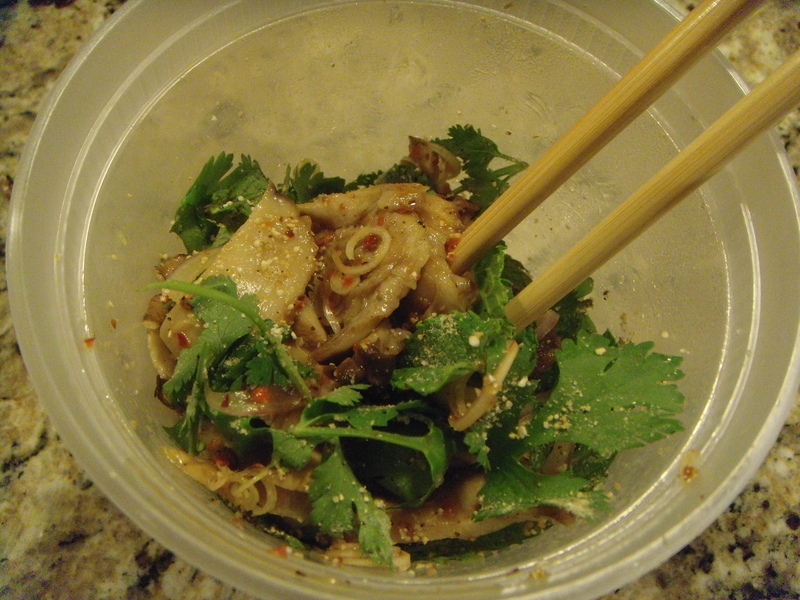 Forest mushrooms, cilantro, mint. Amazing. Since I am lucky enough to have wonderful Thai food delivered to my door, usually once a week, by my fabulous Thai massage therapist, I have not been much interested in going out for Asian food. This however, sounds something I need to try. The problem will be how to fit all of these wonderful places in while I am there. You probably know Thai food better than anyone I know. I will be curious to see how you like it. The wings really are splurge-worthy.